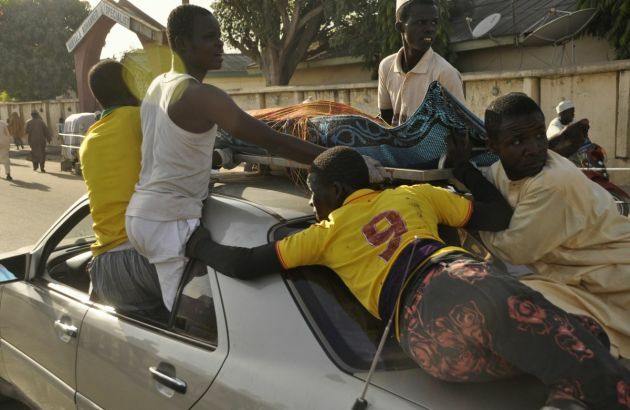 (Photo: REUTERS / Stringer)The remains of the Kano central mosque bombing victim is carried on the top of a car from the Murtala Mohammed specialist Hospital for burial according to Muslim rites, in Kano State, November 28, 2014. Gunmen set off three bombs and opened fire on worshipers at the central mosque in north Nigeria's biggest city Kano, killing at least 35 people on Friday, witnesses and police said, in an attack that bore the hallmarks of Islamist Boko Haram militants. Nigerian Christians and Muslims have met in the mainly Muslim north of the west of Nigeria to open the International Centre for Inter-Faith Peace and Harmony. The center is located in Kaduna, where more than 20,000 people have died in various conflicts over the last three decades and it was opened Aug. 19. It is one of a growing number of interfaith initiatives in Nigeria and its goal is to systematically document interfaith relations to inform national and international policy-making. The Christian Council of Nigeria and Jama'atu Nasril Islam, led the effort to open the center, which was preceded in 2014 by a consultative forum held in Abuja that drew about 40 Muslim and Christian leaders. World Council of Churches general secretary Rev. Olav Fykse Tveit, said at the official opening. "We have come here as pilgrims, Muslims and Christians, to seek the will of God for justice and peace," he said. "Pilgrimages are for people of faith to holy places. That might be places of great historical importance for our faith. "However, places where the sanctity of life, holy in the eyes of the Holy God, are under threat can also be holy places. Like here in Kaduna. "We are today in the city that has been known by many for the fights with religious connotations." But now Kaduna will be a city known for its witness to inter-religious peace and harmony, he said. "This place can be a holy place in a new way, bringing a new vision and anew reality of people of faith living together. Many supporters were recognized at the grand opening, among them Dr. Emmanuel Josiah Udofia, primate of the African Church and president of the Christian Council of Nigeria, Sultan of Sokoto Sa'adu Abubakar, and Dr. Khalid Aliyu, secretary general of Jama'atu Nasril Islam. Prince Ghazi of Jordan and Cardinal John Olorunfemi Onaiyekan of Abuja were among those who envisioned the goals of the center. Malam Nasir EL-Rufai, governor of Kaduna State, formally opened the center. He shared his experience of the way that religious leaders, both Christian and Muslim, sometimes speak and act in ways that hinder interreligious peace. He was, however, strongly supportive of the center as a physical symbol helping Muslims and Christians work together more effectively. Abubakar also expressed support for the center, and spoke about how God wants there to be religious diversity in Nigeria. Onaiyekan said he believes the center could potentially become a model for conflict resolution in other parts of the world.